Amberlea McNaught is a Ceramics graduate of Cardiff School of Art & Design. She has continued her training internationally with skilled artisans, studying traditional art forms from master craftsmen in India and North Africa. Through her combined training she has honed her techniques on the wheel to find a communicative visual language that transcends cultural and historical barriers of identity and origin. She has now established her studio in Sheffield, and It is here, where her world begins to take shape. Her most recent body of work consists of deeply carved black stoneware vessels. Following a residency in Morocco, these pieces translate carved plaster surfaces in to sharp geometric ceramic forms. Flowing freely between the two mediums, she finds ways to incorporate the art of Moroccan architectural plaster carvings, Stucco, in to small tactile thrown vessels. 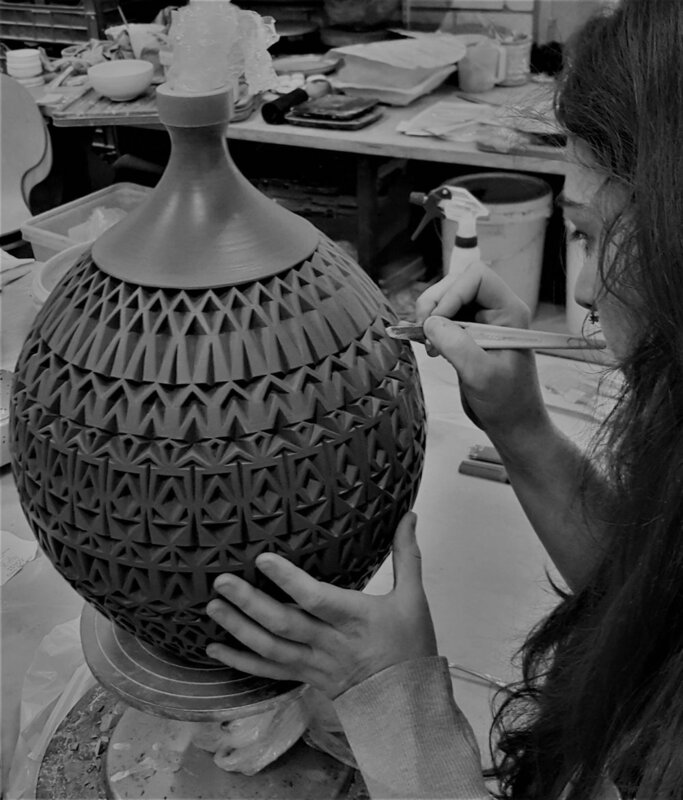 This year she has spent a further 2 months training with her Master Craftsman Abderrazak Bahij in Morocco continuing her studies in plaster carving at the Artisanal Centre in Fes.
" My work pays homage to my Masters who have guided the way and provided me with this creative capacity, to shape earth with my hands and create something people can share their lives with"